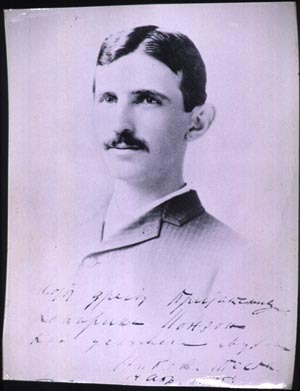 Tesla claims he was offered US$50,000 (~ US$1.1 million in 2007, adjusted for inflation) if he redesigned Edison's inefficient motor and generators, making an improvement in both service and economy. In 1885 when Tesla inquired about the payment for his work, Edison replied, "Tesla, you don't understand our American humor," thus breaking his word. Earning US$18 per week, Tesla would have had to work for 53 years to earn the amount he was promised. The offer was equal to the initial capital of the company. Tesla immediately resigned when he was refused a raise to US$25 per week. Tesla, in need of work, eventually found himself digging ditches for a short period of time for the Edison company. He used this time to focus on his AC polyphase system. 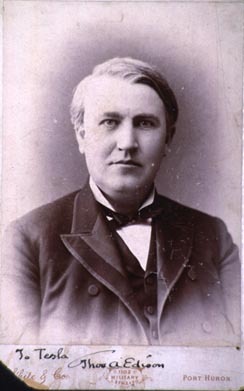 Several months after Edison employed him, Tesla announced that his work was successfully completed. When Tesla asked to be paid, however, Edison seemed astonished. He explained that the offer of $50,000 had been made in jest. "When you become a full-fledged American you will appreciate an American joke," Edison said. Shocked and disgusted, Tesla immediately resigned.